Hilary James' 'elegant singing' (Daily Telegraph) has received much acclaim: quintessentially English but easily crossing the great musical divides from British folk ballads to blues and Berlioz. She's famed too for an unlikely taste in bass instruments (she could turn up with her giant mandobass or slimline, semi-acoustic double bass). Her fine guitar accompaniments cross the genres from Vivaldi to bluegrass and she might even manage a step-dance if the wind is in the right direction. You Don’t Know is the ‘other side’ of Hilary James. Her last album, English Sketches, celebrated the English landscape, weather and seasons through traditional song and new settings of English poetry, but her formative years were influenced as much by the blues, the Great American Songbook, and singing with a big band. Nods to her folky side are still evident here. Deep River Blues is as beloved of ragtime guitar pickers as of bluegrass and old-time bands, but done here as its title requests, Hilary’s voice competing with Brendan Power’s soaring harmonica and Simon Mayor’s violin. It’s performed here with a new bridge section written by Hilary. The granddaddy of ragtime guitar pickers himself, Reverend Gary Davis, wrote Say No To The Devil, in an effort no doubt to guide his followers towards his religious world view; it’s arguable his massively influential guitar playing earned him far more secular disciples. Frankie& Johnnie is the only narrative song on the album: the age old story of love, betrayal and revenge, with a doubly tragic ending. A long love affair with the music of Hoagy Carmichael surfaces here with three tracks. Skylark and The Old Music Master are both collaborations with Johnny Mercer. Mercer was said to have written the tender lyrics of Skylark with Judy Garland in mind, a stark contrast to the ‘roll-over-Beethoven’ themed flippancy of The Old Music Master, but both display his lyrical genius to the full (how many could rhyme spinet with infinite?). Carmichael’s own, brief but fondly affectionate lyrics to New Orleans witness once again the predilection of American writers for ‘songs called cities’. The words to the throwaway Separation Blues were actually written by a man; it’s a song not wholly typical of Patrick Sky, a product of the 1960s Greenwich Village folk scene who became infamous for biting political and social satire. His album Songs That Made America Famous was rejected by numerous labels before eventually gaining publication. Utah Phillips, a man also prominent on the 20th century American folk scene, wrote the enigmatic Rock Salt And Nails. Like Sky, he took a strong political stance, but was more protester than satirist. Gershwin’s They All Laughed, a favourite from the Great American Songbook, has been a lifelong part of Hilary’s repertoire, dating from her days with the big band. It featured in the 1937 film Shall We Dance and incorporated a classic Fred Astaire and Ginger Rogers dance routine. A few years ago, an old recording by Gracie Fields of the rather long, but intriguingly entitled The House Is Haunted By The Echo Of Your Last Goodbye featured on the long-running BBC radio programme Desert Island Discs. After the broadcast, the phone began to ring with friends and relatives suggesting it would suit Hilary’s voice - so here it is! Need Your Love So Bad has achieved the status of a standard among blues-rock artists, similarly in the jazz-blues scene with You Don’t Know What Love Is. Last Show Tonight is a song Hilary first wrote some twenty years ago, dusted off, polished up, but decidedly not to be taken literally...! One of the most stirring female voices in contemporary British folk music belongs to Hilary James. "One of Britain’s finest voices" BBC Radio 4. Spiritually rooted in folk song she may be, but her superb voice crosses the great musical divides and is equally impressive singing blues, torch songs and classical pieces by Fauré and Handel. Her albums have now been played across the media spectrum from BBC Radio’s 2, Radio 3, Radio 4 and The BBC World Service, BBC Regional Radio to Classic FM as well as appearing on numerous radio stations across the world. Apart from her fine singing Hilary James is an accomplished double bassist, guitarist and mando-bassist - her enormous bass mandolin is now her trademark. 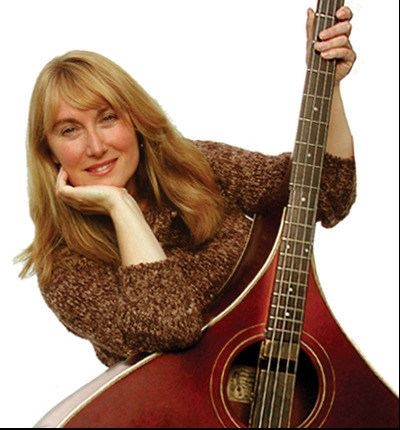 She appears in concert regularly with long-time partner, mandolin virtuoso and multi- instrumentalist, Simon Mayor. You’ll usually find them as a duo, but they’re also half of Britain’s first modern mandolin quartet with Richard Collins and Gerald Garcia collectively known as The Mandolinquents. It was during a four year spell studying Fine Art at Reading University that her interest in music broadened and blossomed. Running the University Folk Club, she acquired a vast and diverse repertoire of traditional ballads, country blues, swing, bluegrass and classical songs. Her taste for the stage was further whetted by spells fronting the University Big Band and performances at the Edinburgh Festival with the University Drama Society. Student days over, she embarked upon a musical career which would find her touring throughout the world. Her highly acclaimed debut album Burning Sun (1993) recently remixed and remastered was a magical and atmospheric blend of folk songs and originals with haunting words and melodies. It reached the album playlist on BBC Radio 2. Plays followed on BBC World Service and stations as far away as Los Angeles and Latvia. The album led to a video shoot in Hollywood with MTV award winning editor/producer Dan Lebenthal. Love Lust & Loss (1993) her follow-up, was an all traditional affair, a collaboration with improvisatory pianist Beryl Marriott. It prompted an equally appreciative press. Q Magazine described it as "A powerful combination of improvisation and musical rigour" while Dirty Linen (USA) effused: "An exquisite piece of work.....a total joy”. While these early recordings had been hailed as milestones in the interpretation of British folk song, her third album, ‘Bluesy’ (1999), was a daring departure and represented a side of her repertoire that had so far been largely neglected on CD. The supporting cast was extensive and included drummer Dave Mattacks (Fairport Convention, Richard Thompson Band and Jethro Tull), legendary blues guitarist Ian Campbell as well as her long-time collaborator Simon Mayor on mandolin, violin and guitar. In tandem with her life as a professional singer, Hilary has always been keenly involved with music for children. After University she gained a Postgraduate Certificate in Education and, with Simon Mayor, began writing and recording the Musical Mystery Tour series of albums. These five albums have achieved true cult status among the young and not so young alike. The Musical Mystery Tour show began to tour internationally and recorded a couple of extended Christmas ‘specials’ for Singapore TV. 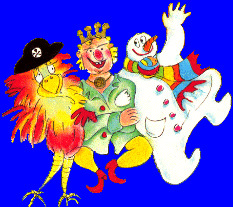 In 1986 she began a six year period (alongside regular concert work) of presenting and writing for BBC Schools Radio and children’s television. Spin offs were frequent and varied! On more than one occasion she found herself writing topical songs simultaneously for such diverse outlets as Newsnight and Play School. She has now written over sixty songs for children and the Musical Mystery Tour series has reached its fifth album. In November 2016 one of the tracks Gobble, Gobble, Gobble was used in The Simpson’s. The experience of working in radio proved invaluable to the independently minded James (she and Simon Mayor were among the first musicians to set up their own label back in 1979), and in 1996 the pair set up their own production company to produce the acclaimed series Marooned with a Mandolin, described as "the best programme on Radio 2 this week" by Gillian Reynolds in the Independent. Although she chose music as her career, Hilary is a keen artist and illustrator and her work can be seen throughout the CDs issued on the Acoustics label. She also illustrated her own song book for Faber Music. In November 2007 at ‘The Gallery’ in Ilkley, Yorkshire Hilary James enjoyed the first of many exhibitions of her paintings. For her 20004 album ‘Laughing with the Moon’ (a return to her roots with a mix of traditional and original songs and tunes) the plaudits went off the scale. Although it was fourth solo album, it featured Simon Mayor's mandolin on four instrumental tracks. In the same year her CD for children (with Mayor), Lullabies with Mandolins received similar glowing press notices. 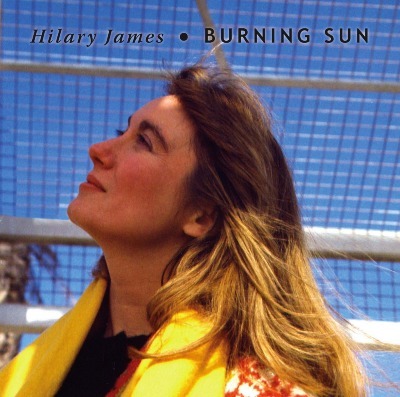 Hilary James' highly acclaimed debut album 'Burning Sun' is a magical and atmospheric blend of folk songs and originals with haunting words and melodies. The album was first issued in 1993 after Simon Mayor persuaded Hilary James to step out from behind the scenes where she had been working to release and promote Simon’s early mandolin albums. 'Burning Sun', includes the spell-binding folk tales of 'The Two Sisters' and 'Polly Vaughan' alongside Handel's beautiful lament, 'Laschia Ch'io Pianga' sung with a bell-like purity. Studio guests include the basso profundo vocals of Hungarian singer Zoltán Kátai, Alan Whetton’s sublime soprano saxophone and Simon Mayor on mandolin and a host of other stringed instruments. It was remixed, remastered and reissued in 2008. The album English Sketches appeared in 2011 and immediately featured in the Sunday Times top ten world music albums. The album is a celebration of English rural life, landscape, weather and seasons in traditional song and new settings of poems by Thomas Hardy, A E Housman and William Shakespeare. 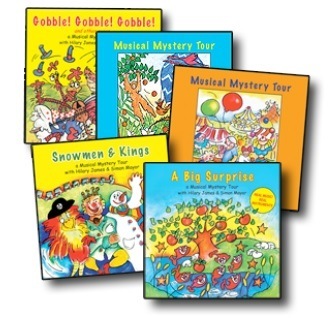 Musical Mystery Tour, A Series For Children. 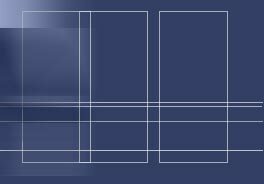 Providing recorded music to associated media, radio producers, film and documentary makers.